So overwhelmed with happiness and appreciation to my horses, owners, interns, helpers, employees, and producers! It has been a great week in Ft. Smith! I would first like to congratulate all the finalists! It is one of the most prestigious futurity and derby that takes place here in the USA 🇺🇸. Rockettes Scientist, owned by Jason Martin and Charlie Cole gave me 110% yesterday in the derby trials. I chose not to run him back because he tried his heart out, and he barely missed making it back in the top 20. Feel the Sting ran the fourth fastest qualifying time in the derby trials; he is also owned by Jason Martin and Charlie Cole. Streakin Queenie didn’t qualify yesterday morning, however I chose to run her in the consolation, which they take back the fastest five derby horses to the finals. She took a bad slip at the first, however we didn’t give up, and Streakin Queenie came through for me! Streaktafamenroyalty, owned by Linda Herron Stenerson and Bruce, tried his hardest! He was just out of placing in the 2d. Streakingivemeawink and NNN Sixums Firewater were in the 2d with some mistakes, however we gave it our best shot! Thank you Clint and Christina Dusendang for taking care of Rock Solid Kiss; Clint placed in the 2d in the consolation. My little niece showed up to hang out! 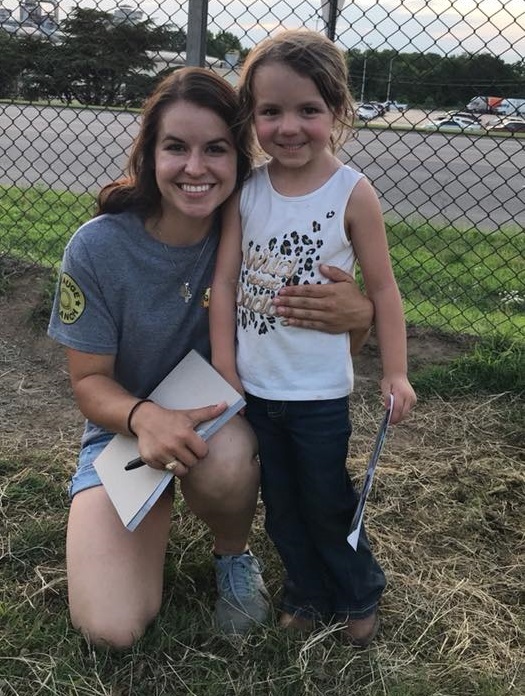 She was able to meet Hailey Kinsel, and Hailey was kind enough to take the time to autograph a picture for her! Thank you so much Hailey! Thank you Ross Harrington and Ava Claire Johnson for working your tails off all day in the heat! Thank you Andrea Workman Enzenauer for taking care of all my ponies! Thank you Alicia Gaida Myers and Dr. Hand for all your help at the shows! Don Lee, thank you so much for having my horses feeling good! Thank Clint Sherlin for keeping my horses feet feeling good with your shoeing skills! Thank you Jody Green, Sierra Emett, and Lisa Downs for all you guys do for me! I couldn’t do any of this without my team! You guys know you are so appreciated!!! "Individual commitment to a group effort--that is what makes a team work, a company work, a society work, a civilization work." I wish all my friends and competitors great Luck tonight! Thank you for visiting website. We mix work and speed to produce premier barrel horses. Many of the the horses I ride are 'R' Bred, Raised and Trained.